This simple cable hat knits up quickly, for a luxuriously soft and smooshy result – perfect for last-minute gifts. To download the .pdf file, right-click HERE, and save the file to your computer! 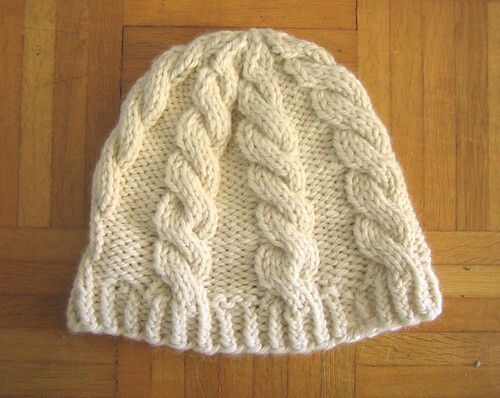 I am unable to download the pattern for Chunky Cable Hat … and would love to knit it. Would it be possible for you to email it to me, please? HEY! Just came across this site and LOVE that hat and I’d love to knit it up as a newly found knitter – but for some reason I can’t access that PDF of your pattern – would you be able to fix the link or send to me? THANKS! Hello there, My associates and I just became aware of your blog through the search engines, and found that it’s very informative. I am gonna watch out for your next post. I’ll appreciate if you continue this in the future. Lots of people will be benefited from your writing. Cheers!